We know that clogged and backed up drains, along with backed up sewers can disrupt your everyday life. Left untreated serious plumbing, housing, and safety issues may result. 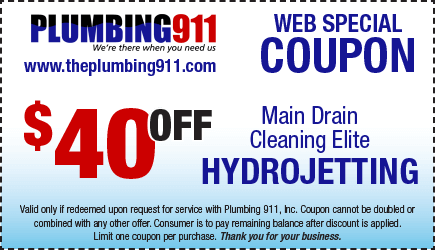 That’s why Plumbing 911 can immediately service all your drain and sewer issues. Based on the type of drain and severity of your clog/backup, our expert technicians expertise will recommend the right type of equipment to get the job done promptly. In addition to different heavy-duty commercial grade cables/snake machines, we also offer video camera inspections and high pressure jetting.